Sometimes it’s the company of a simple cookie that does the trick when you crave a little bite of something that could qualify as a treat. 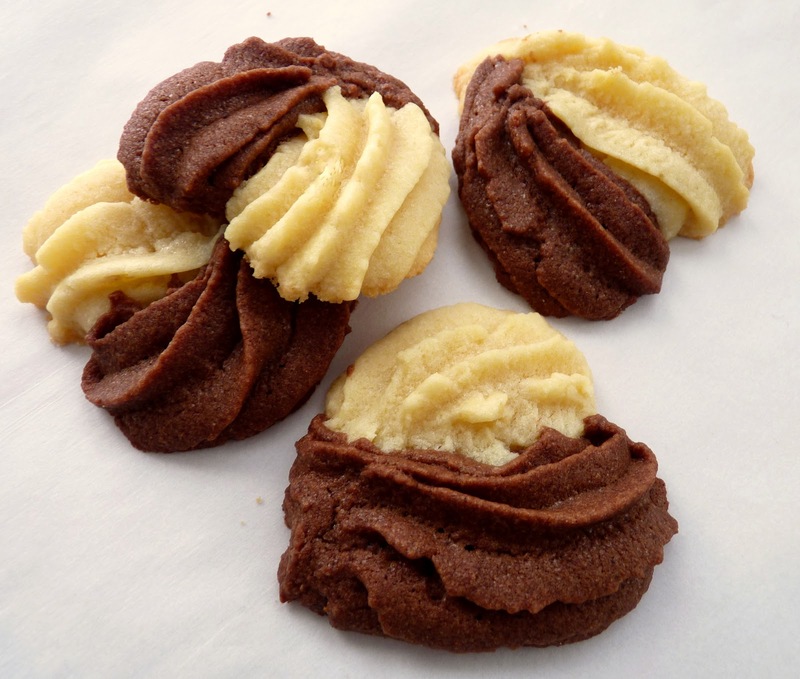 Cookies don’t require the commitment of a piece of cake or pie or a dish of custard. They are small enough to enjoy quickly without a whole lot of evidence lying around. Just a couple of bites and presto! Unless, of course, the cookies you have before you are super delicious and should be consumed slowly and with pure pleasure. All you cookie mavens out there know what I mean. 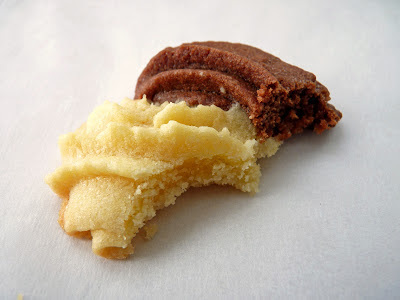 This is a fairly simple but very enjoyable cookie that is half vanilla and half chocolate spice. The texture is crumbly and extremely satisfying. The chocolate dough has the warming spices of cinnamon, black pepper and cayenne and a dab of almond extract. So what you get is a nice old fashioned vanilla flavor combined with a bite of perky chocolate. Two in one, just in case you’re not in the mood to choose. - I made fluttery little hearts, but you can pipe any shapes you want - logs, circles, zigzags or whatever - as long as the cookies are all the same size and will bake evenly. I suppose you could also try to layer the dough and then chill or freeze and slice, although I haven’t tried that. Whatever size or shape you prepare, just make them uniform. If you make smaller cookies, watch the baking time to ensure they are light and crisp. - Make and pipe the vanilla dough first. It's just easier to keep the mixing bowl and pastry bag free of chocolate while working with the vanilla. - To pipe the cookies, I used Ateco #9825, a 7/16” open star pastry tip. - Be careful not to overbake these cookies. They should not take on any color. You can tell they are done if you give them a little nudge upward with your finger and they do not stick to the parchment or silpat. They may seem soft but will firm up and crisp as they cool. 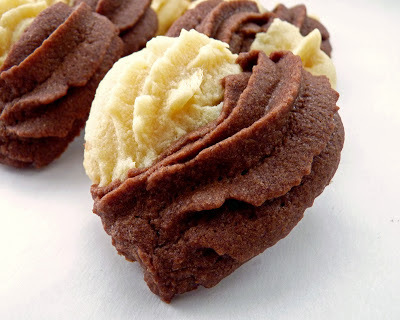 - If you like this very delicious combination, also try the Chocolate and Vanilla Swirl Cookies. Preheat oven to 350 degrees. Prepare 2 baking sheets with parchment or silpats. Fit a pastry bag with a medium open star pastry tip. For the vanilla dough, whisk the flour and salt together. Beat the butter and sugar until creamy and completely blended. Scrape down the bowl. Add the egg yolk and combine thoroughly. Mix in the vanilla. Scrape down the bowl. Add the flour and salt and mix just until there are no dry patches. Set the dough aside. For the spiced chocolate dough, whisk the flour, cocoa powder, salt and spices together. Beat the butter and sugar in a large bowl until creamy and completely blended. Scrape down the bowl. Beat in the egg white and mix thoroughly. Mix in the vanilla and almond extracts. Scrape down the bowl. Add the dry ingredients and mix just until there are no dry patches. Place the vanilla dough into the piping bag and pipe cookies in desired shape, 12 to a baking sheet. Repeat with the chocolate spice dough, complementing each vanilla shape. Gently press down any rough edges with your fingertip to smooth and flatten. Bake for 10 – 12 minutes or just until a cookie lifts or slides easily without sticking when lightly nudged. They should not take on any color and will firm up as they cool. Cool on a wire rack. 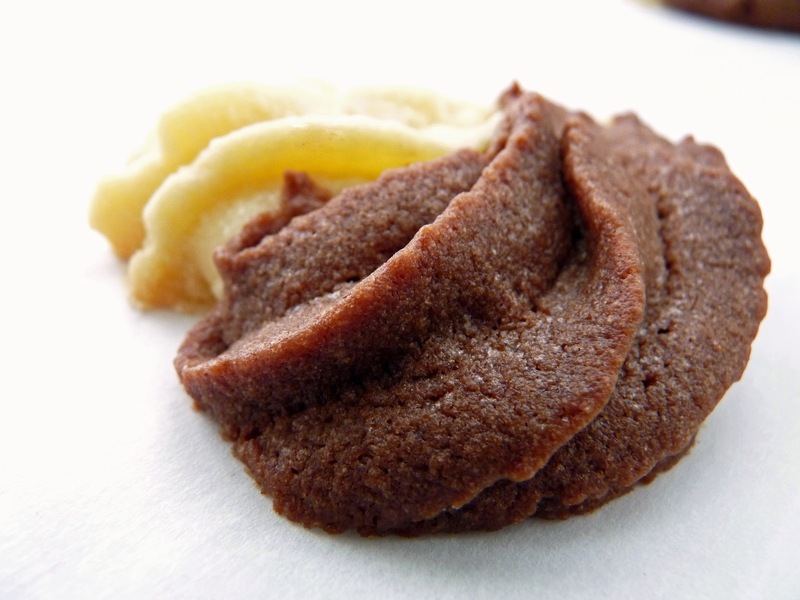 Cookies can be stored in an airtight container at room temperature for up to a week. Good luck with that! I love ruby red grapefruit. I love the shock of beautiful bright color and the bold burst of unapologetic tartness that comes with every bite. It’s readily available in most markets and it's full of Vitamin C. I can't resist. This is a light and refreshing dessert that celebrates the plain goodness of yogurt and the full fresh jolt of citrus. It’s not a fancy preparation or a complex flavor profile or anything particularly clever. It’s just a cool and creamy excursion into the lighter side of the dessert spectrum that is easy to prepare and doesn’t require any special tools. Simple and satisfying, it's a soft and soothing landing place as we head into spring. Ah, spring! - This dessert should be consumed the same day it is made. - When blooming gelatin, do not pour water onto powdered gelatin. Always sprinkle the powder slowly into cold water to avoid clumping, which will not dissolve and ruin the texture of the final product. Once you’ve added the gelatin to the water, do not stir. The gelatin and water mixture will turn opaque. When ready to proceed with incorporating it into the recipe, heat gently to liquefy so it can be combined smoothly and thoroughly with the dessert mixture. So it goes like this: powder combined with water becomes gel and then is transformed into liquid and combined with the ingredients, then chilled to set up. 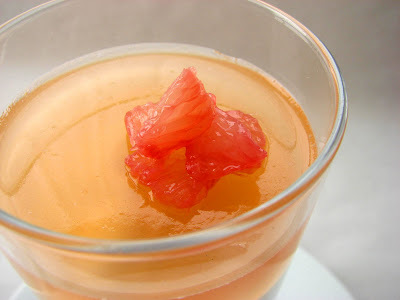 - Taste your grapefruit juice and adjust the sugar level according to your own preference for sweetness. - Salt is very important in coaxing maximum flavor out of citrus. Add a few grains and taste. Keep adding a few more until you achieve a deeper and brighter flavor. You’ll know when you get there. - I'm remembering a really delicious dessert produced in a pastry kitchen where I once worked that was a perfect composition of lemon curd foam, bergamot meringue, Campari gelée and shards of brisée. So if you like Campari, you might want to experiment around with a splash of that. For the Yogurt Mousse, bloom the gelatin by sprinkling it into a small cup containing 2 tablespoons of cold water. Do not stir. Let it sit for 5 minutes until the gelatin is fully absorbed. Whisk together the yogurt and sugar. Add the lemon juice and combine thoroughly. Liquefy the gelatin by placing the cup in a pan of shallow simmering water. Pour into four to six serving glasses or cups. 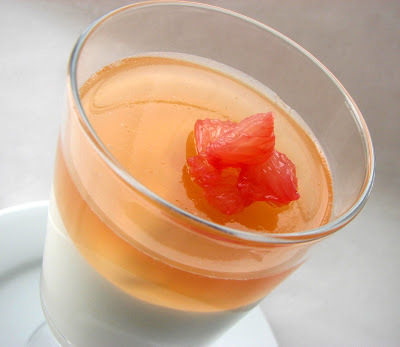 When the Yogurt Mousse has sufficiently set up, begin the preparation of the Grapefruit Gelée. 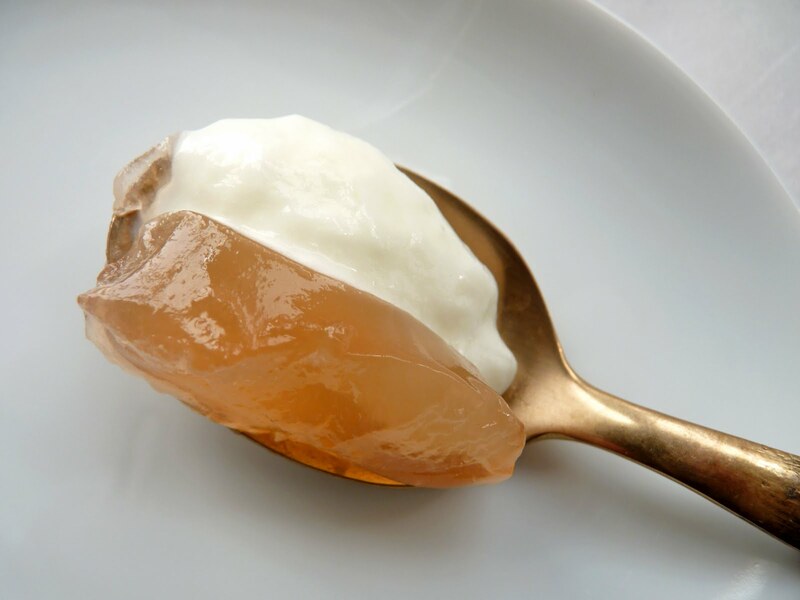 Bloom the gelatin in a small bowl by sprinkling it into a small cup containing 2 tablespoons of cold water. Do not stir. Let it sit for 5 minutes until the gelatin is fully absorbed. Place about 1/4 cup of the grapefruit juice and the sugar in a saucepan and warm over low heat just until the sugar is dissolved. Cool and combine with the remaining 3/4 C grapefruit juice and the lemon juice. Taste for sugar. Add a very small pinch of salt, to taste. Whisk into the grapefruit juice. Pour onto the top of the set Yogurt Mousse, distributing equally. Refrigerate for about an hour or so or until set. Slice the grapefruit sections into bite sized pieces, garnish and serve. I have a romantic fascination with hazelnuts because they remind me of the gorgeous Piemonte region of Italy where they are ground with chocolate to prepare the wonder that is gianduja. I love the way hazelnuts find their way into so many fabulous Italian desserts, most of which are nearly impossible to resist. Whether they’re in the form of luxurious ice cream and gelato, tortes, praline, cookies or cakes, hazelnut pastries are supremely delicious and go so very well with lots of different adornments. In the Unites States, hazelnuts are commercially produced in Oregon and Washington. 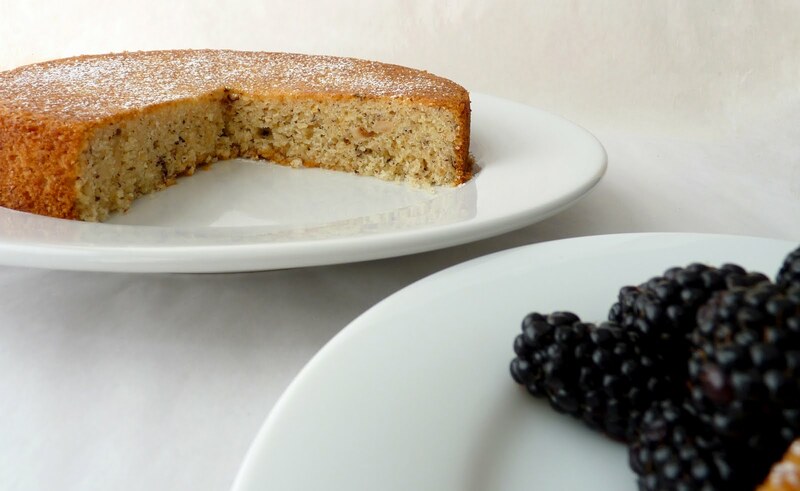 This is a very simple nut cake brimming with the taste of toasted hazelnuts that are finely ground with the flour. 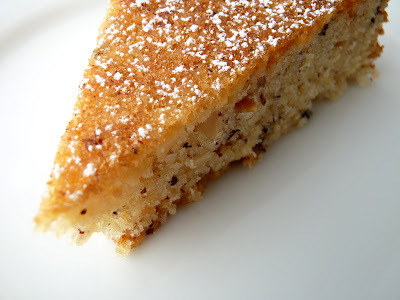 The texture is light with a bit of texture from the addition of some chopped hazelnuts in the batter. 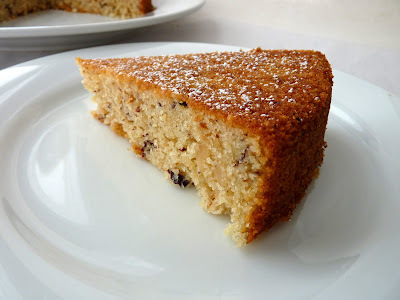 There is also a nice dose of orange zest to really perk up the flavor but otherwise it’s a pretty basic and delicious rendition of a nut cake. It’s very easy to make and would grace any table, be it a picnic or formal dinner. One of the things I love about this cake is that it’s extremely versatile. It would be fantastic covered in a chocolate or mocha glaze or an espresso glaze. You can add your favorite spice. Serve with fresh blackberries or raspberries, figs baked in honey and balsamic, nectarines or peaches in a honey lemon syrup, poached pears, balsamic cherries, honeyed apricots, caramelized apples or a simple cluster of grapes. The cake would also be great with caramel or coffee ice cream. Or a simple dollop of whipped cream flavored with vanilla or brandy. And on and on, it’s a great canvas for your own best customization. - To toast hazelnuts, put them in a single layer on a baking sheet in a 350 degree oven for about 10 to 15 minutes or until lightly browned and the skins look cracked. Watch them carefully as hazelnuts can turn bitter if toasted too long. Remove from the oven and wrap the hazelnuts in a kitchen towel to let steam for a couple of minutes. Then rub them together to loosen and remove as much of the skin as possible. Cool completely. - To cover the cake in chocolate glaze: gently heat 3/4 C heavy cream just to the boiling point and pour over finely chopped 5 oz bittersweet or semisweet chocolate (or a combination of the two). Stir slowly until combined. Pour evenly over cake. Preheat the oven to 350 degrees. Grease and flour an 8 x 2 1/2” cake pan and line the bottom with parchment paper. Place the flour, baking powder, salt and 3/4 C toasted hazelnuts in the bowl of a food processor. Process for a couple of minutes or until the hazelnuts are finely ground and you can smell their wonderful aroma. Pour into a bowl and set aside. Finely chop the remaining 1/4 C hazelnuts and set aside. Cream the butter and the sugar until pale and fluffy, about 3 - 4 minutes. Add eggs and egg yolk one at a time, fully incorporating each into the mixture and stopping to scrape down the bowl after each addition. Add the vanilla and orange zest and combine. Scrape the bottom of the bowl. Slowly add the flour in three additions, alternating with the milk and beginning and ending with the flour. Mix until the batter is just about completely combined. Take off the mixer and use a rubber spatula to finish mixing by hand and fold in the remaining 1/4 C chopped nuts. Pour the cake batter into the prepared pan and spread it evenly with a spatula. Bake for about 28 – 30 minutes or until a tester comes out clean. Let the cake rest for 10 minutes. Gently run a thin bladed knife around the edge of the pan and invert the cake onto a plate. Remove the parchment and cool completely. Dust with confectioner's sugar. Every now and then you just might need a little bit of a chocolate fix. Not a super-rich-knock-you-out mega-dose, but a nice friendly reminder that chocolate exists in this world. You know, something that satisfies your longing without sending you to the couch. I happened to have half of a log of Odense almond paste left over from another project so I thought I should put it to good use. Since I think chocolate and almonds are soul mates, I made this loaf cake using dark Dutched cocoa for a wonderful deep flavor to match the delicious concentration of almonds in the almond paste. If you’re wondering what the “Dutched” in Dutched cocoa is all about, it’s a process invented in the mid-1800s by Dutch chocolate maker Coenraad Johannes van Houten where the cocoa nibs are treated with an alkaline solution (usually alkaline salts like potassium or sodium carbonates) before they’re pulverized and dried. This neutralizes the acidity of natural cocoa and removes its harshness and bitterness while still retaining its complex flavor profile. Since the alkalinity is different, it's important to note when a recipe calls for natural or Dutched cocoa because the leavening will be calibrated to account for this. In some recipes it makes a big difference, in others not so much, depending on the balance of ingredients. 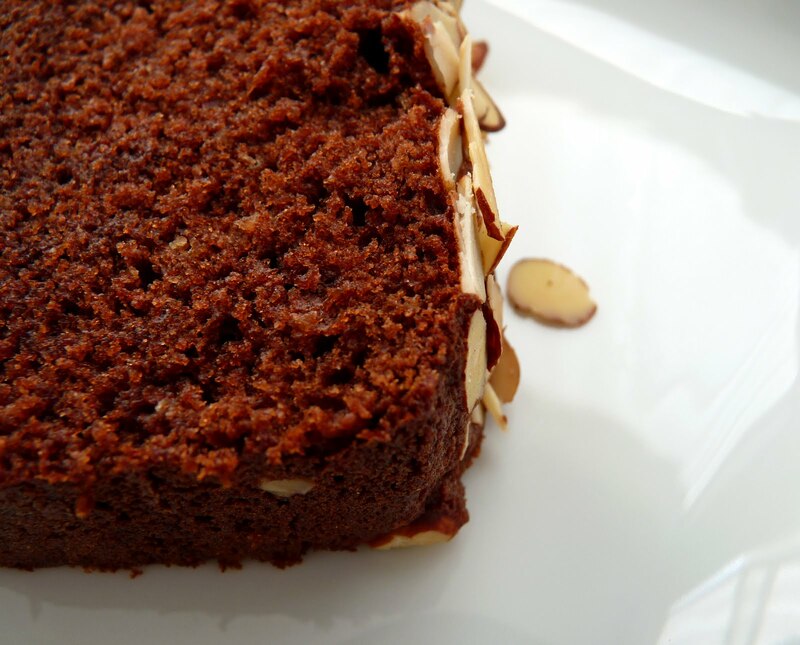 In this recipe, the Dutched cocoa powder is bloomed in a little bit of strong hot coffee and there is also a little touch of cinnamon to add to the complexity without overwhelming the other flavors. The resulting cake has a beautiful aroma and is very tender with a fine soft crumb that melts in your mouth. 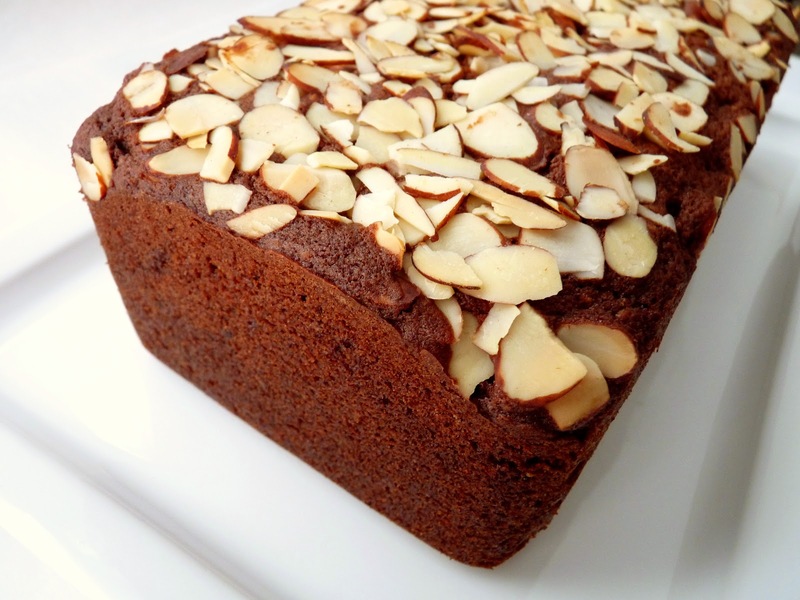 The almond and cocoa are in fine balance, so it’s really delicious without being too heavy or too rich. It also makes a nice gift to anyone who loves the beautiful conspiracy of chocolate and almonds. So brew up a cup of your favorite dark roast coffee beans and settle into a bite of this reminder of the exquisite pleasures of fine cocoa. - Almond paste is not marzipan, which is almond paste that is made much sweeter with a lot of additional sugar. 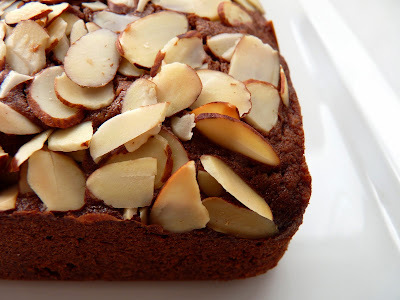 Almond paste has a higher ratio of almonds. I used Odense brand, which can be found in most markets in the baking section. Odense almond paste comes in a box containing a 7 oz log, so you can either double the recipe to use it all or you can wrap the remaining half a log in plastic wrap, place in an airtight container or ziplock bag and refrigerate it. 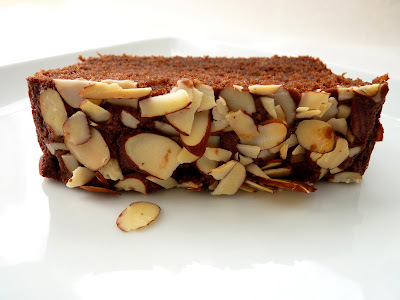 It will keep for quite a while and there are lots of recipes available that use almond paste. Bring it to room temperature before using. - Valrhona is probably the best Dutched cocoa powder available, but it’s quite expensive. If you use cocoa powder often and want to buy another decent brand in bulk at a cheaper price, I suggest Cacao Barry Extra Brute Cocoa Powder (Cacao Barry is the French division of Barry Callebaut). Chocosphere sells 1 Kg (2.2 lb) bags for $13.95. 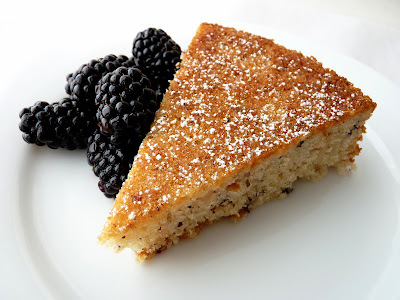 - If you don’t have a food processor, you can break the almond paste into small clumps and using the paddle on a stand mixer, beat it with the sugar until it is blended into very fine granules. This will take awhile. - If you don't have buttermilk, measure out 1/2 cup of milk and add 1 1/2 teaspoons lemon juice. Preheat oven to 325 degrees. Grease an 8 1/2” x 4 1/2” loaf pan and line with a wide strip of parchment paper, leaving a couple of inches of overhang on the long sides of the pan. Sift the flour, baking powder and soda, cinnamon and salt and set aside. Mix the cocoa powder into the hot coffee and whisk until smooth. Combine the buttermilk and vanilla. Cut the almond paste into thin slices and place in the bowl of a food processor along with the 1/4 cup of granulated sugar. Process for a couple of minutes until the paste is broken into fine granules and blended with the sugar. Pour this mixture into the bowl of a mixer, add the 1/2 cup of brown sugar and mix until thoroughly blended. Add the butter and beat on medium speed until light and fluffy, about 5 minutes. Add eggs one at a time, beating well after each. Scrape down the bowl. Add the chocolate mixture and beat until just combined. Lower the speed and add flour in three batches, alternating with buttermilk and beginning and ending with flour. Mix until it just about comes together. Finish blending the ingredients off the mixer, using a rubber spatula to fold by hand until there are no streaks of flour or butter. Pour into the prepared pan and smooth out evenly. Distribute the sliced almonds over the batter and press gently into the surface. Bake for about 55 minutes minutes or until a tester inserted comes out fairly clean with just a few crumbs attached. Cool completely on a wire rack. Gently lift the cake out of the pan using the parchment paper as handles. Remove the parchment and serve.